A beautiful Prothonotary Warbler emerges after a short rain shower along the boardwalk at Magee Marsh in northwest Ohio. 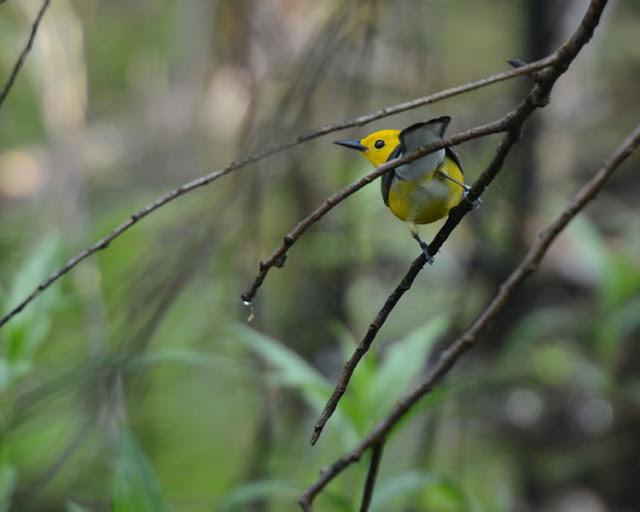 ...the luminescent yellow of a Prothonotary Warbler's feathers cuts through the murkiest of wet days and deep shadow. Yesterday, at work, I hung some Rothko prints on the wall -- one was the yellow and blue painting. 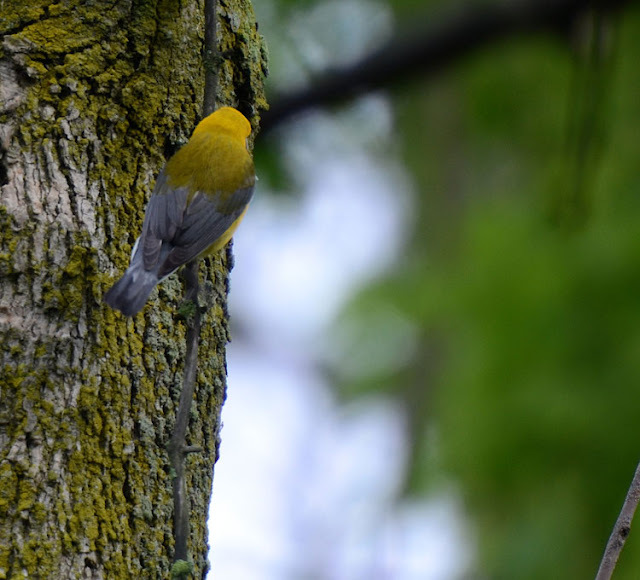 As I look at this shot of a Prothonotary Warbler from behind, it seems Mother Nature and Mark Rothko were dipping from the same color pots! ...sketched quickly from the boardwalk at Magee Marsh (5-9-2012), this Prothonotary Warbler was inquisitive. He hunted nonstop for insects, but every now and then, he'd give me a quick glance in response to a bit of pishing. I remember thinking I would spend more time studying one of these birds along the Little Miami River near my house this summer. Usually at least one pair nest there every summer and offer great viewing. This summer, however, it was a mystery. Because I was only able to get out a few times in the summer's heat, I don't know how the couple fared. Thank goodness I spent the time I did at Magee Marsh watching this fellow intently. I hope you had a more productive summer of birding than I did. In all of my adult life, I never spent a summer more removed from nature, and I hope I never have to do that again. My first day back in the woods two weeks ago was like a balm. I had no idea how much I rely on the woods and all the creatures within to keep me balanced and happy. Lesson learned...get to the woods, or the fields...or the beach (and stay there if you can)--because we all know it, Birding is Fun! You were missed, that's for sure! I'm in the same boat. Worked all summer, most of the spring too, and now I'm cranky about the birding I missed. Kelly, I am so sorry that you had so much on your plate this summer. I know the balm of which you speak and need to refresh myself with it frequently! I hope you are able to get out there some more before the cold winds of winter drive you back indoors! Keep on sketching! Nice work. Great images, loved this blog, I'll follow you. So sorry to hear that you were not able to venture outside much and be with nature. Unfortunately, I found myself in the same situation. In the coming months, I hope your schedule opens up a bit so you can enjoy the great outdoors once again. As always, your photographs and sketches are exceptional! Hola Julie :) Me gustan mucho las fotos del Prothonotary Warbler, el color de su plumaje es delicioso. Además los sketches son muy buenos. Saludos cordiales Sonia. 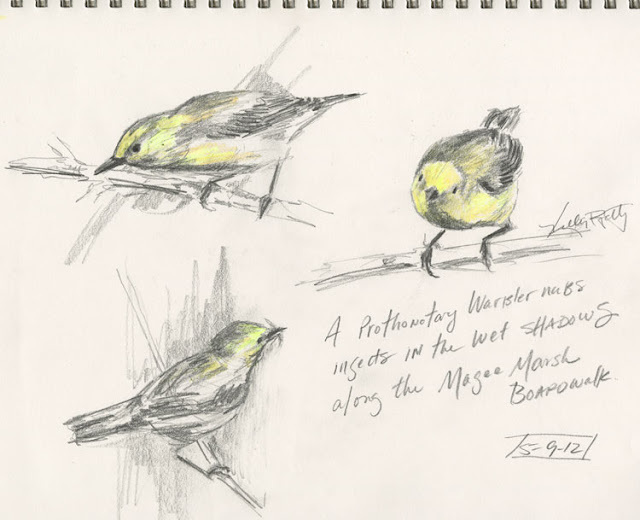 Wonderful sketches and photos as always of a great bird. I hope things ease up giving you more time soon. As you know...birding is a great way to stay centered and balanced...not to forget that it heals the pain of living in the 21 Century. Nice post, Kelly, beautiful shots of the Prothonary Warbler! I too had an unproductive summer. I got out frequently enough but I missed seeing many of our usual summer visitors, and I can't come up with any explanation for it. 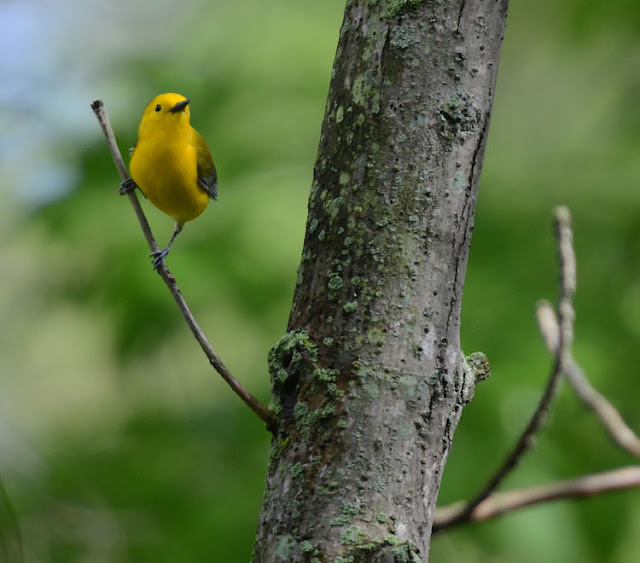 I got to see a Prothonotary Warbler in CT once.It was on the rare bird report.You really picked up the glint in the eye on that first one-nice! Birding is one of the best ways to exercise and do art work also. Great art work. Hope all goes well. One of my favorite warblers. Magee Marsh is an awesome play for birding. Great post.